Indium Corporation's Heat-Spring® compressible soft metal thermal interface material is now being used in Green Revolution's CarnotJet™ liquid server cooling system. Green Revolution's CarnotJet™ System is one of the most powerful and efficient computer server cooling systems in the world. With over 100kW of cooling potential per rack, it can reduce a data center's total energy use by 50%. It is used by some of the world's top supercomputer sites. According to Indium Corporation's Thermal Interface Materials Product Line Manager, Jordan Ross, "Green Revolution's technology uses 100% liquid immersed electronics in a dielectric fluid. Polymer based thermal interface materials will not work in such an environment. Indium Corporation's metal Heat-Spring® enables this technology by providing a stable and highly effective thermal interface." "The Heat-Spring maximizes the thermal efficiency of CPUs and GPUs installed in the CarnotJet system's dielectric fluid cooling environment," said David Banys, Director of Marketing at Green Revolution Cooling. "Indium Corporation's product gives customers the freedom to submerge servers produced by any OEM." 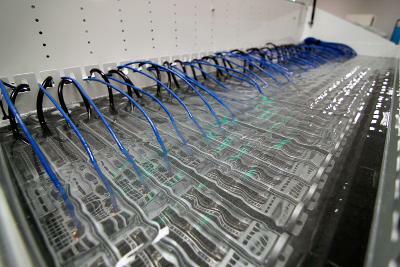 Green Revolution Cooling produces the CarnotJet™ fluid-submersion cooling system for data center servers. The technology reduces data center cooling energy use by 95% and has installations at five of the top 100 supercomputing sites worldwide.